Make sure your c-store’s game plan is in place this football season! Offer promotions on game-day snacks your customers won’t want to pass up. If you’re like me, you’ve been not so patiently waiting for the 2018 football season to begin. Well, it has arrived! Whether you’re an NFL fan or a College Football fan (Go Dawgs! ), when the time comes to sit down and cheer for our teams, we all share the same excitement and anticipation. We’re now three weeks into the NFL season and four weeks into College Football but the seasons have only just begun! As a convenience store operator, keeping tabs on the sports industry can play a vital role in your store’s performance. With the start of football season, sales of prepackaged snacks (e.g. chips, dip/salsa, etc.) increase, along with beverage sales (beer and spirits leading). In 2017, Fox Business reported that beer consumption increased 36 percent during the NFL’s opening weekend. So, what does this mean for your c-store? As alcohol consumption increases during football season, c-stores have a prime opportunity to leverage market demand. Make your c-store the one-stop shop for the football fan’s needs. By recognizing the opportunity to provide snacks and drinks for game-day, operators can position their c-store as a part of the football season consumption boom. All you need is a game plan. The first step is to determine which items you’d like to sell to customers. This is important because you want to sell the items your customers are looking for on your shelves and are likely to buy based on seasonal trend analysis. The next step is to offer a promotion on those items to leave customers with the feeling that they’ve cashed in on a deal from your store. The last step is to designate an area within your c-store, making it easy for your customers to walk in and find those items. Remember, above all else, appealing to your customers is the prime focus. Once you’ve selected the items you’d like to promote during the season (and don’t be afraid to switch your selections up if some items sell more than others), it’s time to craft promotions specific to those items. Offering BOGO’s (Buy-One-Get-One) or bundle options are great ways to drive increased sales and return sales to your business. If you’re uncomfortable offering a BOGO, try modified options such as Buy-One-Get-One Half Off, Buy-Two-Get-One Half Off, etc. Bundling options is another great way customers look to get more out of a deal. Try offering a bundle around drink/snack combos (alcoholic, non-alcoholic, or both) or snack/dip combos. Just make sure the BOGO or bundle deals you create work well for your business – there’s no point in offering these types of deals unless they ultimately increase your profit. When in doubt, software can help you determine which items sell well together, so you can offer the most effective bundles without guesswork or gut-based promotional strategies. Does your c-store offer food service? Include a promotion around those items as well. 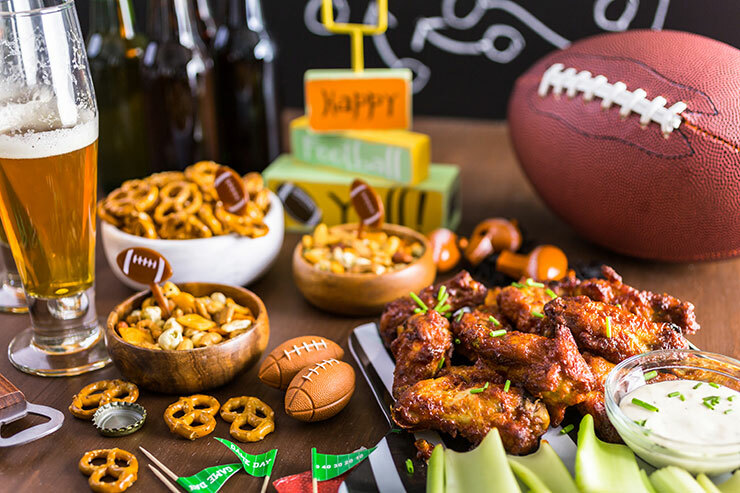 Whether it’s roller-deals, wings, pizza, chicken – customers are looking to feed more than themselves on game-day, so providing a discount or deal on large-quantity purchases is a win-win for both you and your customer. How do you know if your promotions are working? Make sure to track your inventory levels to best understand which items and promotions are functioning in conjunction to appeal to your customers. PDI offers inventory management solutions so you can know down to the item-level, bag, bottle, case and container, how much stock of any item you have in store. The solutions can suggest when to reorder stock based on store purchase history, trend data analysis, and upcoming events (you can input dates where you expect higher-than-average traffic – like during football season). Once you’ve created your game plan, it’s time to run with it. And remember, for whichever promotion style you decide on, maintaining the right stock in the right amount is key to enticing a repeat customer. Did You Know: Your Source for PDI News provided by PDI, the leader in enterprise management software for the convenience retail and petroleum wholesale markets. Click here to learn how PDI can help you thrive in today’s digital economy.